Play time for the youngest set. Story time, crafts and song for children of all ages. This innovative story time focuses on sensory practices. For children of all ages, especially those with special needs. Focusing on art themes. For children of all ages. Focusing on science, discovery, and math. For children of all ages. Stories, art, songs, games, and dramas. Enjoy stories while developing your creativity. Come read to a dog and improve your reading skills and confidence. Children 4–12 yrs. Stories, songs, games, crafts and fun. Enjoy stories while developing your creativity. Come read to a dog.The Reading Education Assistance Dogs (R.E.A.D.) program improves children's reading and communication skills by employing a powerful method: reading to a dog. But not just any dog. R.E.A.D. 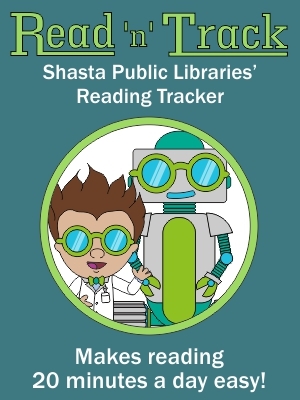 dogs are registered therapy animals who volunteer with their owner/handlers as a team who come to the Redding Library to be reading companions for children. Children of all ages, come play board games and video games. For more information call 530-245-7253. Come enjoy great children's stories geared for preschoolers at the Burney Library. Stories and crafts. Toddlers to age 5. For more information call 530-335-4317. An innovative story time focusing on sensory practices. For children of all ages, especially those with special needs. Stories, stickers, songs and crafts for everyone to enjoy.Sponsored by the Friends of the Anderson Library.